Work continues on our Guest Favorites Garden, a small garden space where we highlight plants and flowers that are favorites of our guests. This year so far has been a challenging gardening year for our zone (Zone 7b), with a warm start to spring in March, a week-long cold snap in late April, and then a hot and dry start to summer. 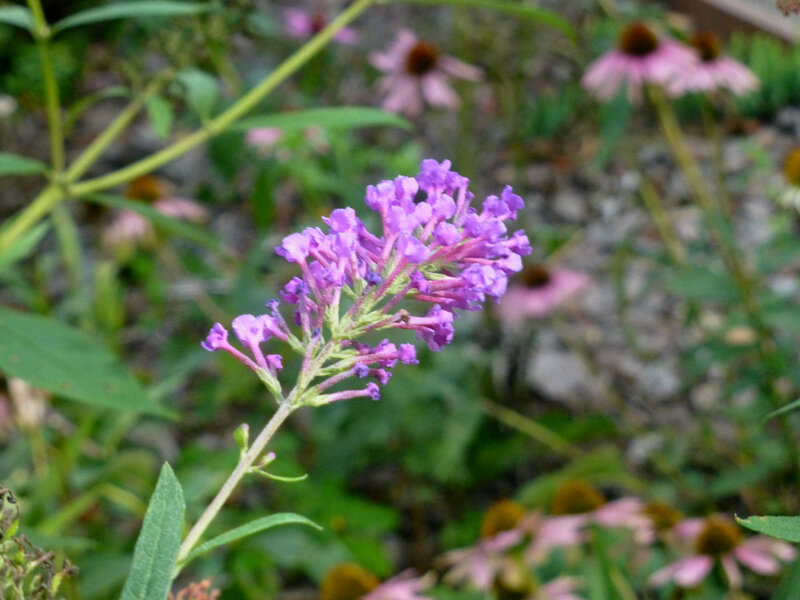 Our drought-tolerant perennials in the Guest Favorites Garden have been real troopers so far, with our year-old butterfly bush and coneflowers having a very happy season. This year, we added several astilbe to the shaded area near the hostas and they fortunately are making it through the summer, yay! We’ll also be adding more hostas next spring. Other additions this year include daylilies, a rose bush and short evergreen shrubs. Coming next year — perhaps another butterfly bush, and definitely more coneflowers and coreopsis. We’re also considering bugleweed for our dry stream element to tie in some hardscaping with plants. Let us know your favorite plants when you stay with us at Inn on Mill Creek and we’ll look to add them to the Guest Favorites Garden. This entry was posted in Flowers at the Inn, From Your Innkeepers and tagged flora and fauna, garden spaces by Inn on Mill Creek. Bookmark the permalink. I truly enjoyed all your flowers, your butterflies, birds and other wildlife. It was a joy to experience such a serene place with color, the sounds of water, the breeze and sun, which was a natural way to refresh my soul. I appreciate the effort it takes to turn this home and landscape into what you envision it to be.I look forward to the additional flowers and greenery that you plant for us to enjoy.